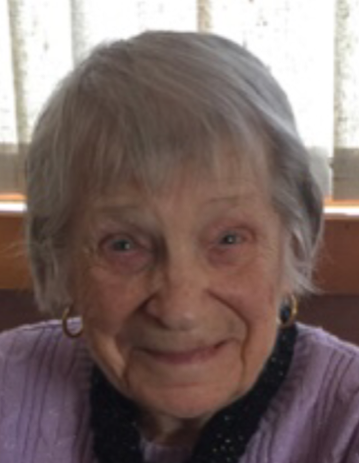 Obituary for Muriel L. (Ring) Graveline | Kostanski Funeral Home, Inc.
Muriel L. (Ring) Graveline passed away peacefully on February 2, 2019 at Buckley Healthcare Center in Greenfield, Ma. just shy of her 99th birthday. She was born on 2/25/20 to Hebert and Helen (Hibbett) Ring in Brattleboro, Vt., and devoted stepdaughter to Charles Roy, who helped raise her from a young age. She graduated from Hinsdale (N.H.) High School, class Salutatorian, in 1938. She attended Keene Normal School (now Keene State College). She married Joseph (Joe) W. Graveline at St. Joseph's Rectory, Hinsdale, N.H. on 3/11/44 (her mother's birthday), while he was home on leave from the U.S. Navy. They were married for 58 years. She was predeceased by her parents Helen and Charles Roy, husband Joe, brother Charles Roy Jr., and sister Sylvia Gleason. Survivors include a sister Harriet J. Beckwith of Stoddard, N.H., niece Catherine J. Stevens (Brian) of Jericho, Vt., nephew Jon C. Roy of Hinsdale, N.H., niece Janice D'Alessio (Steven) of Keene, N.H., step niece Amanda Cooke (Tyler) and a cousin Helen Fournier of Freeport, Me. She also leaves her husband's family, nieces and nephews Kathy and Dennis O'Rourke, Jeff and Robin Neipp, Cindy and Rick Gwosch who lovingly cared for her during the last years of her life and niece Jeannie Kim Snow while she lived at Buckley Healthcare Center. She is also survived by sisters-in-laws Ruth (Graveline) Demo and Betty Graveline, and many more nieces and nephews. Muriel was the last of the trio fondly known as the "Golden Girls" which included her late sister-in-law, Minnie (Graveline) Quintana and dear friend Arlene (Squeakie) Gwosch. They loved their weekly visits to the South County Senior Center in South Deerfield and monthly visits to the Colrain Senior Center. The ladies loved Bingo, playing cards, shopping, going out to eat and an occasional trip to the casino. They thoroughly enjoyed their "golden years" together. Muriel was an inspirational mentor and guiding light to many of the women in her family and beyond. She had an interesting and varied employment history. During the war from 1944-45, while her husband Joe was deployed overseas, she was a telephone operator in Hinsdale, N.H. (above the P.O. ), where she said the switchboard would "light up like roman candles" when news came in about the war. After the war in 1945, she was one of the first women hired as a laboratory technician for the Greenfield Tap and Die where she retired in 1969. Muriel and Joe took a serious interest in camping dating back to the 1950's and became involved in NAFCA (North American Family Campers Assn.). They were instrumental in starting a chapter here in western Massachusetts. Muriel and Joe loved camping with her sister Harriet and brother-in-law Beck in their Apache tent camper. They enjoyed many annual August trips to Hermit Island in Maine, and their favorite state park in Greenfield, N.H. Catamount in Colrain was a weekend retreat where their dear friends the Grays from Colrain and the Shaws from Buckland would join them. Her handwritten memoir, "The Crazy Campers", depicting their camping experiences over the years, has delighted many family members and close friends. In 1969-71 they managed the Historic Valley Park (campground) in North Adams, Ma. But after many New England winters they decided to move south. It wasn't too long after arriving in Florida, they were once again managing a campground. This time a resort campground known as Cypress Point Resort Campground in Tarpon Springs, Florida. After more than 20 years of "retirement" managing campgrounds, they finally really retired to Dunedin, Florida until their return in 1998, to Greenfield to be near family. Muriel and Joe resided at the High Rise in Greenfield, she organized the blood pressure clinics and activities for all her friends while a resident there. Muriel was a talented knitter who made many blankets and hats for the nursery at Franklin Baystate Medical Center and Cheshire Medical Center. Her mittens were worn by many kids at Trinity Christian School. In 1960, Muriel was State (N.H.) President of The American Legion Auxiliary. The family wishes to thank Jane Plager NP, Greenfield Family Practice, for many years of wonderful care, Buckley Healthcare Center which supported her for the last year of her life, and Hospice of Franklin County which granted her a peaceful passing. A committal service at Calvary Cemetery at 11:00 AM followed by a Celebration of Life will be held on May 18, 2019. There's still time to send flowers to the Graveside Service at the Calvary Cemetery at 11:00 AM on May 18, 2019.